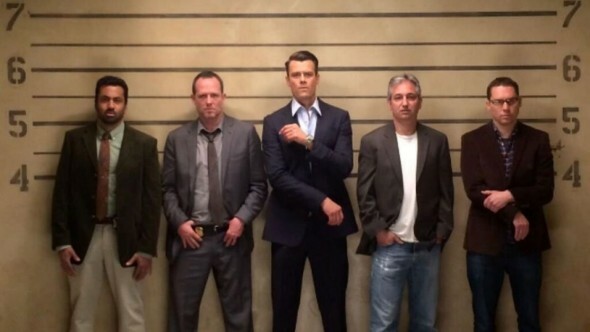 Performers include: Josh Duhamel, Dean Winters, Janet McTeer, Kal Penn, Aubrey Dollar, and Edward Fordham Jr.
A drama, this TV series revolves around two mismatched law enforcement officers. They have polar opposite views of the world and (possibly) a grudging respect for each other’s abilities as they clean up the streets of Battle Creek, Michigan. Detective Russ Agnew (Dean Winters) is a good but gruff and hard-boiled detective. He’s had his world turned upside down when strikingly handsome and charismatic Special Agent Milton Chamberlain (Josh Duhamel) opens an FBI field office at the police station — and he chooses Russ to be his partner. Milt’s polished sophistication and access to unlimited state-of-the-art equipment is impressive to his new co-workers in the absurdly underfunded department. The pair work long hours together in the economically distressed city and it remains to be seen if Milt’s charm and endless supply of high-end resources or Russ’s old-fashioned cynicism, guile and deception will be the keys to catching the bad guys. Other characters include Commander Guziewicz (Janet McTeer), Detective Fontanelle White (Kal Penn), Holly Dale (Aubrey Dollar), and Aaron Funkhauser (Edward Fordham, Jr.). What do you think? Do you like the Battle Creek TV show? Do you think it should have been cancelled or renewed for a second season instead? Battle Creek: Cancel or Keep the New CBS Series? One of the very few shows all 4 members of my family enjoyed watching. Two girls and a wife and we all were disappointed when it was taken off. Watched entire 1st season on Netflix. They should bring it back. Just watched entire season on Netflix-really enjoyed the storylines, characters and interactions. Appreciated there was no need for profanity or extreme violence but still had subtle innuendos with humor also. A great series, wish Netflix would pick it up & produce more seasons. Bring it back. Bring it back. This show is awesome. I can not believe they cancelled it. I was witty and well written. Please bring it back. Well said Holly. I’ve been think about Battle Creek lately. What a great show, so much better than the new 2016/2017 shows. Bring it back. The cast and writing was magical .